Our creative and friendly team of stylists will attend to your every bridal need. With 14 years’ experience in the wedding industry, we’re proud of our reputation to go the extra mile. Based in Ewell, Surrey our bridal shop offers free parking right outside the door, step inside and let us put the wow into your wedding day and help you find the perfect wedding dress. 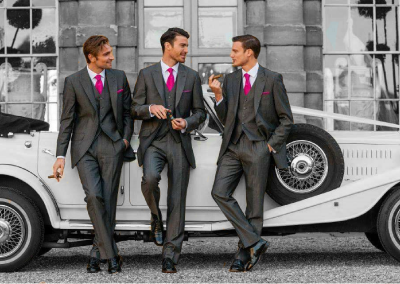 We have an extensive range of men’s formal wear, wedding suits and accessories to hire and inspire. From contemporary slim-fit to traditional tails and stylish kilts, choose the one to complement your wedding look and theme.